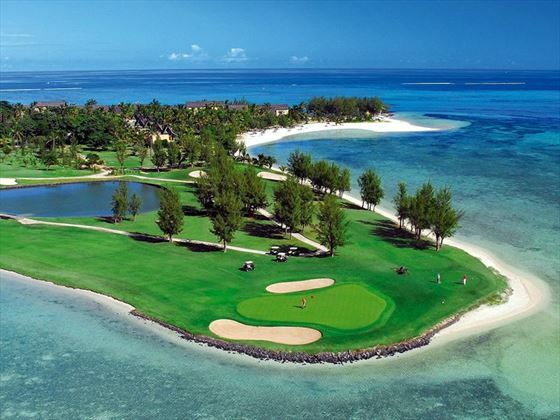 Elegant and majestic, the Dinarobin Beachcomber Resort & Spa is a breath-taking property in one of the most beautiful locations on the southern coast of Mauritius. The perfect place to unwind and renew, the atmosphere is tranquil and inviting. 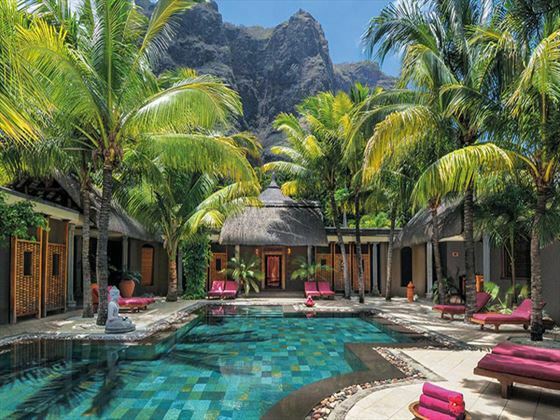 With a stunning backdrop of Le Morne mountains, you’ll be overwhelmed by the sublime scenery and the spectacular facilities within the resort combine to make this an unforgettable holiday destination. 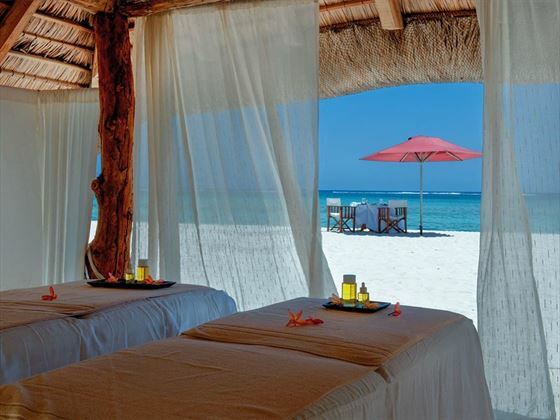 Treat yourself to a treatment at the luxurious Clarins Spa or take part in an exhilarating and unforgettable excursion, such as swimming with dolphins. 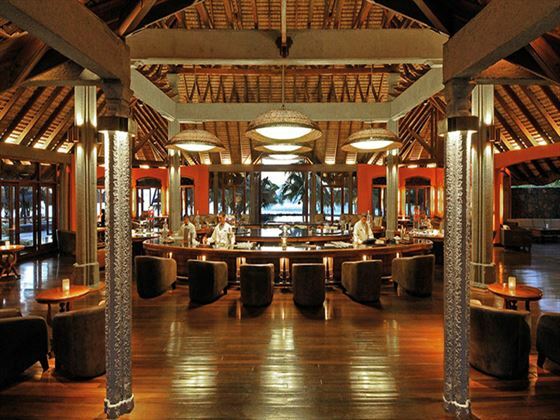 The friendly staff help you to settle in straight away, ensuring a stress-free and relaxing stay. 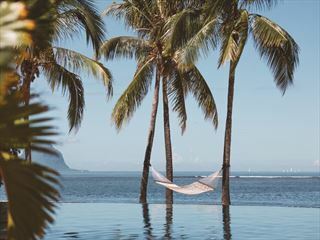 Couples will love the peaceful ambiance of this indulgent resort, where you can admire the awe-inspiring exotic views and truly unwind in style. 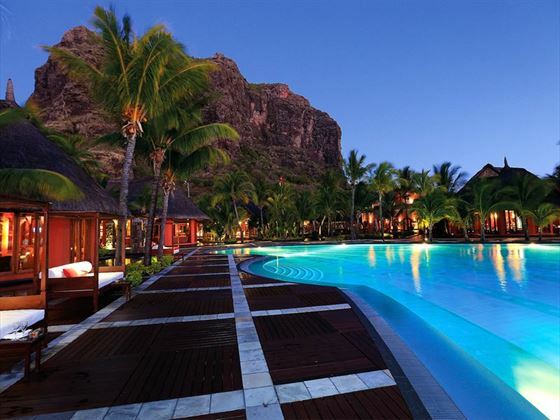 The resort is located on the south west coast of Mauritius, on the Le Morne peninsula and within easy reach of Port Louis and Curepipe. 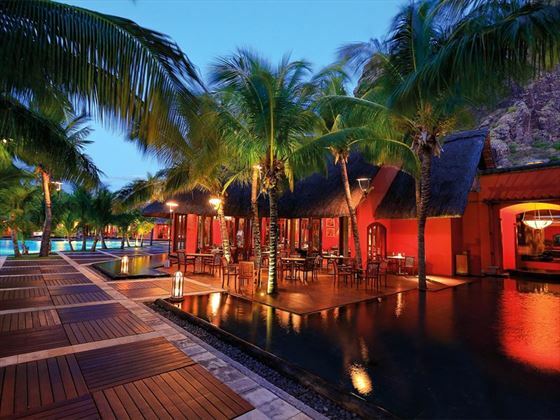 The resort provides 174 suites and villas, each with a balcony or terrace. Junior Suites – Spacious suite with views of the gardens, including an en-suite bathroom with large walk-in shower and a private terrace. Club Junior Suites – Boasting a peaceful ambience, these suites have a lounge area and terrace, with a private pool and access to the exclusive Club at Dinarobin. 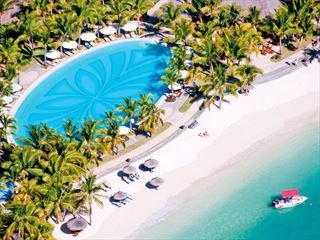 Club Junior Suites Beachfront – Offering amazing views of the beach, these suites have spacious bedrooms, intimate terrace and access to the exclusive Club at Dinarobin. 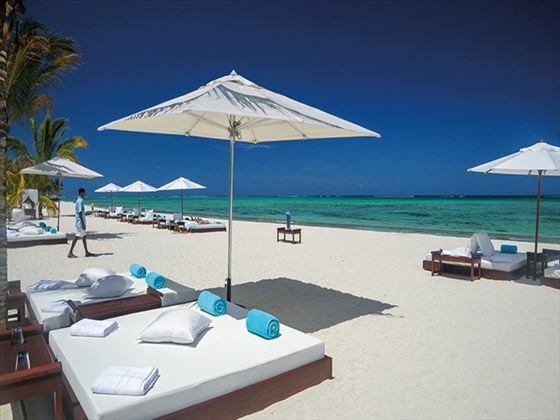 Club Senior Suites Beachfront – Just a stone’s throw from the beach, these suites are spacious and elegant, including an outdoor living area, dining area and access to the exclusive Club at Dinarobin. 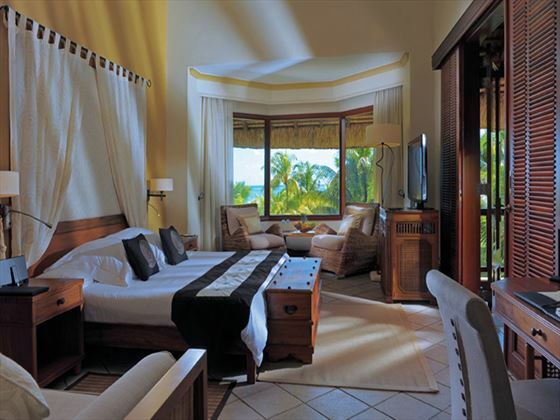 Family Suite – Surrounded by tropical gardens, these suites feature a spacious terrace with furniture, two bedrooms and bathrooms, a private pool and great details for the kids such as child-size robes and bottle warmers for infants. Club Family Suite – This suite features a terrace with outdoor furniture, indoor lounge area, two bedrooms, great details for the kids such as mini bathrobes and slippers, and access to the Club and Dinarobin. Villa – The villa features a private pool, beach access, relaxing dining area, outdoor bar and BBQ area, terrace with furniture, four bedrooms, three bathrooms and surrounding tropical palms. * Club lounge is adults only (18+ years) but families can obtain included drinks at the main bar. 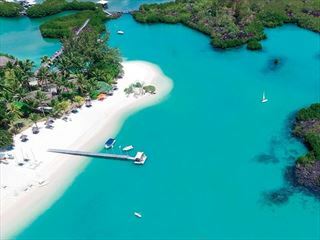 The resort also has two bars – Le Mahogany and Le Martello, open 10am-1am and 8am-8pm respectively. 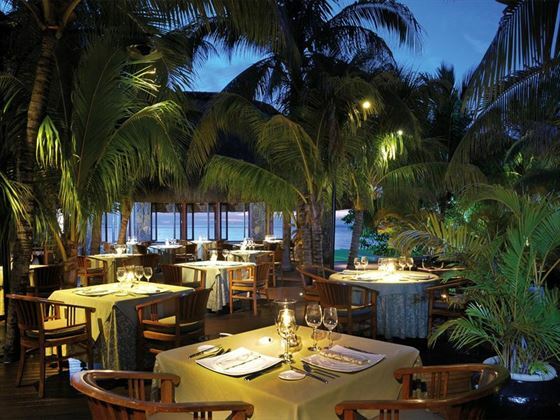 Guests can dine at sister hotel Paradis Hotel & Golf Club. 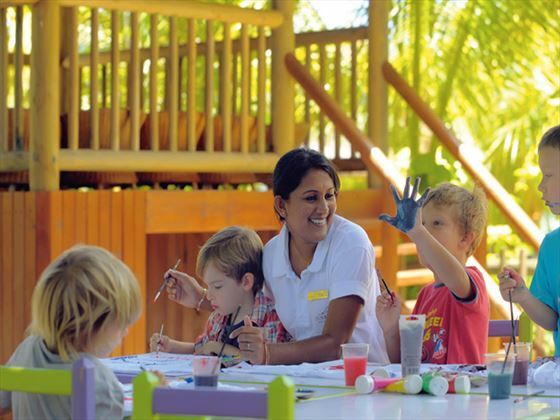 Dinarobins’s Kids Club, available for ages three to twelve, provides a fun activity programme for little ones, including arts and crafts, games, excursions, a double-storey Wendy house and a private play area. For Honeymoon couples, one Tropical Elegance T-shirt for the groom and one pareo for the bride. For Wedding Anniversary couples, one souvenir gift. 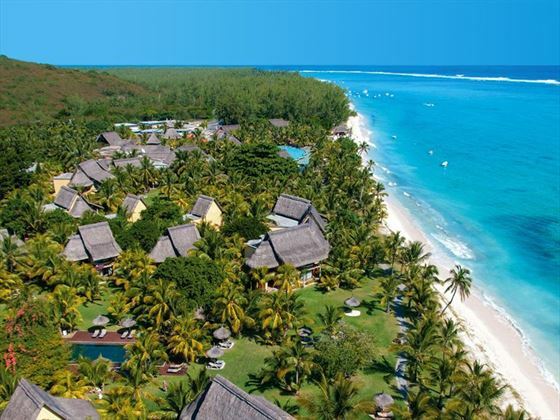 Stretching along Le Morne Peninsula, on the South-West coast of the island, Paradis Beachcomber Golf Resort & Spa offers luxury accommodation and a full range of land and water sports; including a spectacular golf course, or relax at the rejuvenating spa.